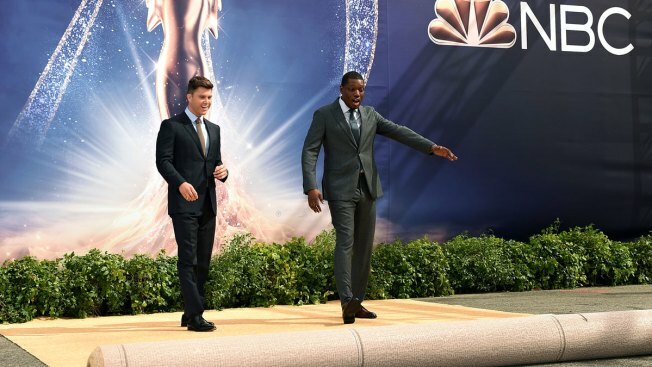 Presenters Colin Jost and Michael Che roll out the gold carpet for the 70th Emmy Awards at Microsoft Theater on Sept. 13, 2018, in Los Angeles, California. The first Emmys, handed out in 1949, honored local Los Angeles programming in television's early days with a half-dozen awards. The landmark 70th edition, which airs Sept. 17 on NBC, boasts scores of nominees spanning broadcast, cable and streaming outlets. The Emmys might air live from Los Angeles on a Monday night, but the broadcast is shaping up as a "Saturday Night Live" affair. The show racked up 21 nominations, tops in the comedy field. Plus, "Weekend Update" anchors Michael Che and Colin Jost are hosting the awards bash. But as with any live broadcast, unknowns abound: Will a long summer layoff hurt the current events-driven NBC comedy stalwart with Emmy voters? Perhaps more importantly: Are Che and Jost are ready for prime time? Donald Glover left the Emmys last year with acting and directing honors for the standout first season of FX's "Atlanta." His inventive, incisive and occasionally surreal comedy about race and growing up (among other things) reached new heights in its sophomore go-around, scoring 16 nominations (including five for the great "Teddy Perkins" episode). This should be the year of "Atlanta," especially with "Veep" out of the mix. But Glover and Co. face strong competition from Amazon newcomer "The Marvelous Mrs. Maisel," which earned 14 Emmy nods for its tale of a Joan Rivers-like comedian's bumpy rise. "The Handmaid's Tale," last year's drama winner, returned for its second season amid the dawn of the #MeToo era – delivering an outing even more harrowing in its depiction of the brutal oppression of women in a not-so-distant U.S. But there's plenty of dystopian drama, violence and political intrigue to go around in the category, perhaps representing a larger reflection of the times. Sure, "The Handmaid's Tale" notched an impressive 20 nominations. But that's only third among the dramas – "Game of Thrones" amassed 22, while "Westworld" logged 21. "The Americans," FX's Russians-in-our-midst story, could get some farewell Emmys love while "The Crown," "This Is Us" and "Stranger Things" threaten to turn the competition, well, upside down. Comedy is serious business these days, judging from the Outstanding Variety Talk Series category, which includes "Daily Show"-tied talent Samantha Bee, Stephen Colbert, Trevor Noah and 2016-2017 winner John Oliver. ABC's Jimmy Kimmel, whose show has become more driven by political news since the presidential election and since his son's heart defect awakened him to healthcare disparities, also made the cut. A vote divided among hard-edged humor shows could drive an opening for CBS' James Corden, whose June "Carpool Karaoke" with Paul McCartney provided late-night television's most uplifting segment in recent memory. Netflix scored 112 nominations, ending HBO’s 21st century dominance in the No. 1 spot (the cable network placed second, with 108 nods). Hulu and Amazon Prime Video didn’t approach those numbers but made the Top 10 – each largely on the strength of a major contender (“The Handmaid’s Tale” for Hulu and “The Marvelous Mrs. Maisel” for Amazon). It’s unclear, of course, which outlet will take home the most trophies, but industry leaders will be closely watching how the streaming outlets do this year. Average viewers likely don’t care where their favorite shows originated – another sign of a changing landscape that would have been all but unimaginable when the first Emmys were bestowed in 1949.